For many today, content consumption is no longer a focused activity. Instead we’re always connected and using multiple screens. Using more than one device at a time, we seamlessly move from one piece of content on one device to another on a different device either sequentially, simultaneously or separately. These evolving content consumption patterns have important implications for marketers. 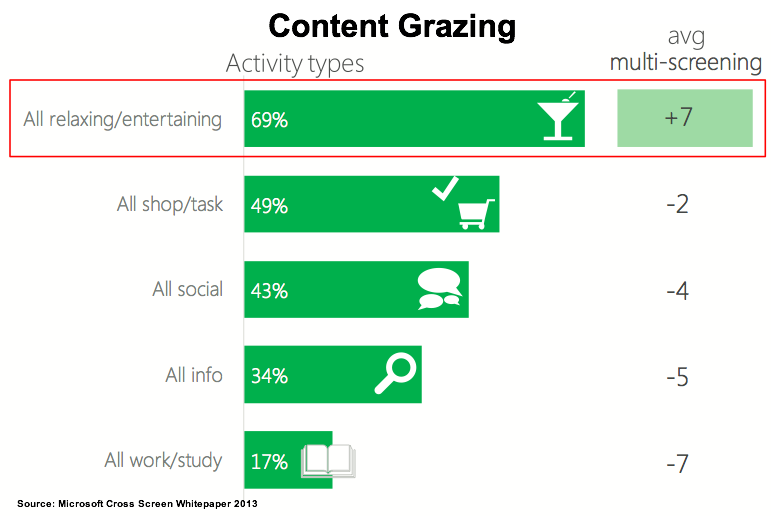 Content grazing is when consumers use two or more screens at the same time to access separate or unrelated content. While often referred to as “multi-tasking”, the research shows that it tends to be closer to distracted behavior involving entertainment. 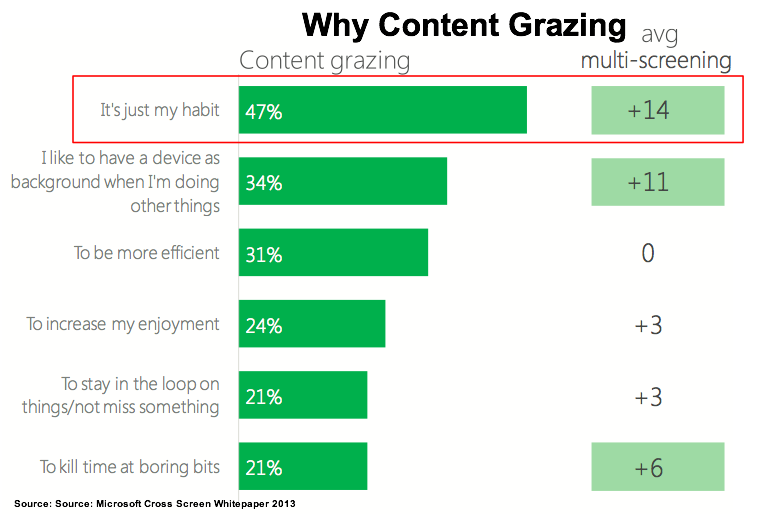 About half of respondents view content grazing or multi-tasking as a habit. While about a third use it as a background. 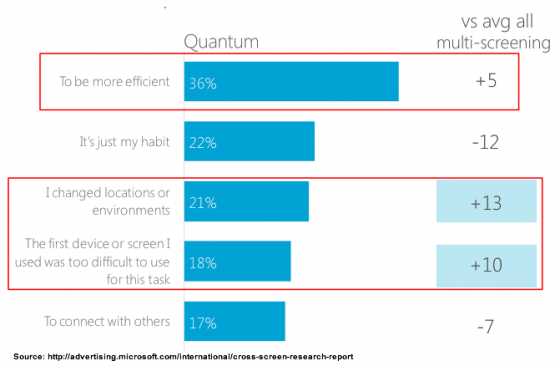 Interestingly, about a third view multi-screen use as being more efficient despite the fact that research has shown that this isn’t the case. Don’t underestimate the one out of five respondents who use it to stay in the loop or avoid the boring bits. Think television advertising avoidance. Almost seven out of ten respondents grazes on other content for entertainment, implying consumers are seeking escape. But don’t overlook the half that graze to shop. Two-thirds of respondents use multiple screens to feel in control; they choose when and what they view concurrently. It’s important to point out that it’s the only activity that indexes positively. Television: Used at home in the evening, often for entertainment. Laptop: Is the workhorse that’s mainly used alone early in the day. It’s useful for time sensitive activities. Smartphone: Often used if others are present as a means to stay connected socially and to gather useful information. Also for one-to-one communications, mainly texts. 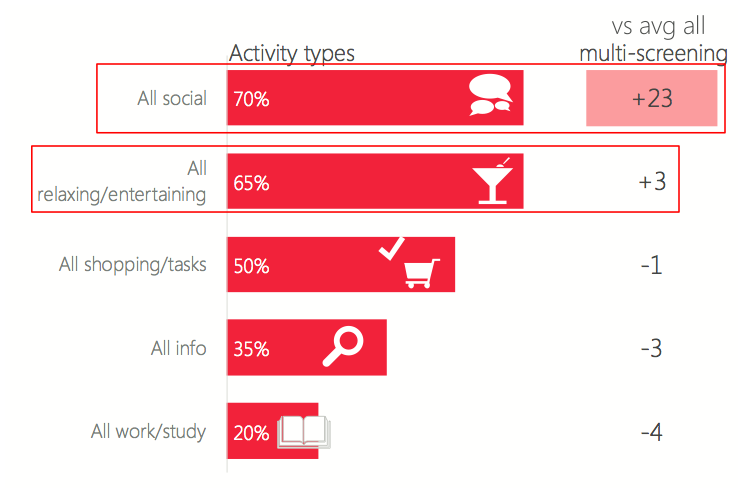 Tablet: More likely to be used when alone for more involved activities like gaming. Provide entertaining content to entice prospects during their escape time. Make your content easy-to-consume. Think snackable content. Ensure your content is viewable on a mobile device, specifically a smartphone or tablet, to allow prospects to find you when they’re looking. This is particularly important for customers who are in your store or your competitor’s store! Investigative Spider-Webbing is a form of dual content consumption of related content on two or more devices at the same time to gather additional information to enhance the primary screen experience. About a third of users check a second device to get more information. Unlike other forms of content engagement, most of the investigative spider webbing is for personal reasons. It’s about the viewer’s curiosity. This is important for marketers and branded content. Television: Is often the spark for seeking additional content. It’s used at home in the evening. Laptop: Offers control to television viewing and answers questions. Smartphone: Provides a polite way to gather information if others are present. Tablet: Likely to be used at home to enhance viewing. Can be used with others around for information gathering and connecting. Provide content to supplement relevant television shows. 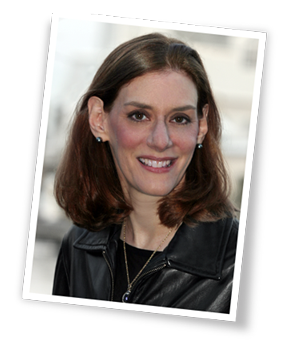 Think in terms of extending the television experience or supplementing your television advertising. Create content for tablet use that shows your product in context. Make it easy-to-consume. Social Spider-Webbing is the opposite of Investigative Spider-Webbing in that it’s extroverted. Focused on sharing and connecting, it allows viewers to connect with others (both friends and like minded individuals) while watching live events and television shows. Overwhelmingly social spider webbing makes solitary content consumption a social activity. More than two out of five respondents use it to connect with others. About a third use it habitually. 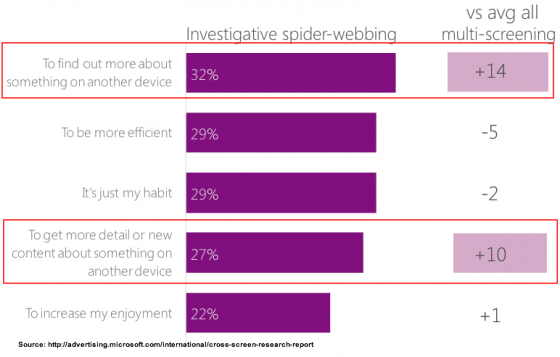 About one in four chooses social spider webbing to enhance their enjoyment of their content consumption. 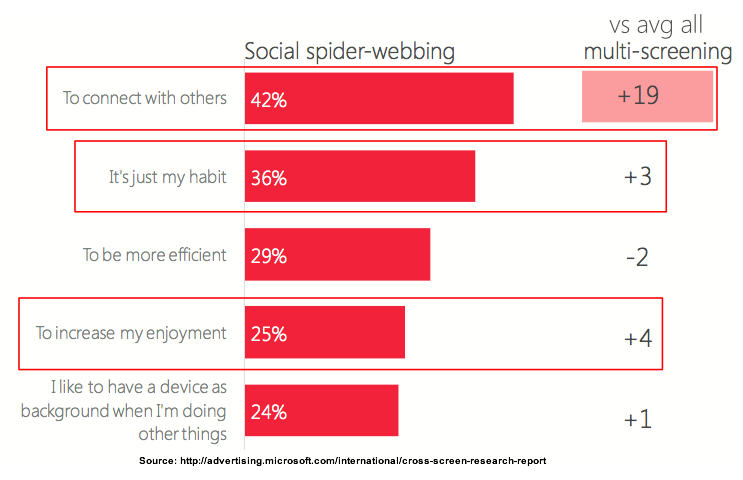 By definition, social spider webbing is a social activity for seven out of ten respondents. Also, about two-thirds consider it a relaxing, entertaining activity. As expected social spider webbing makes viewers feel enjoyment (60%). Additionally it gives about two out five viewers a sense of conviviality and belonging. Television: is the spark for engagement. About one out of five times it’s a live event. Laptop: More likely to be used when alone. It’s often focused on helping others. Smartphone: It’s used to communicate with others either one-to-one or via social networks. Tablet: More likely to be used when others are present for fun activities than a laptop. Extend live television events with special content such as behind the scenes interviews and footage or a conversation on Twitter. Use hashtags to help track and engage your audience. With quantum content consumption, participants are goal-oriented. They sequentially move from one activity on one screen to another one on a different screen. Their goal is to efficiently finish a task. While a third of respondents changed devices to be more efficient about a fifth of respondents changed devices due to a change in location or a need for a device that was better suited to the task. 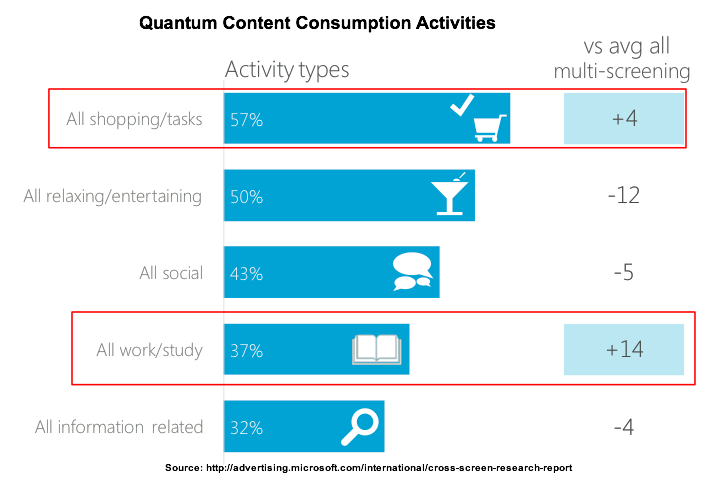 Being task-oriented, Quantum content consumption tends to be used for shopping (57% of respondents and work related (37% of respondents) tasks. While about two-thirds of respondents experienced a sense of control with quantum content consumption. Relative to other multi-screening experiences, they felt a sense of power, recognition and security. By finding the appropriate information, they were on top of their game. Television: is used at home when others are present. It’s often the spark for engagement. Can meet discovery and enrichment needs. Laptop: Mainly used at home in the evening for information gathering. It’s key to decision making activity. Smartphone: Is used all day both home and away to start and finish activities. It’s used for communication or to get more information. Can bring social engagement into the process. Tablet: Mainly used at home to discover and gather information. Ensure that you provide content to aid prospects and customers gather information related to purchase decisions. Make it easy for prospects to share your information with influencers, product user and/or social network. Remember many purchase decisions require input from others for various reasons. 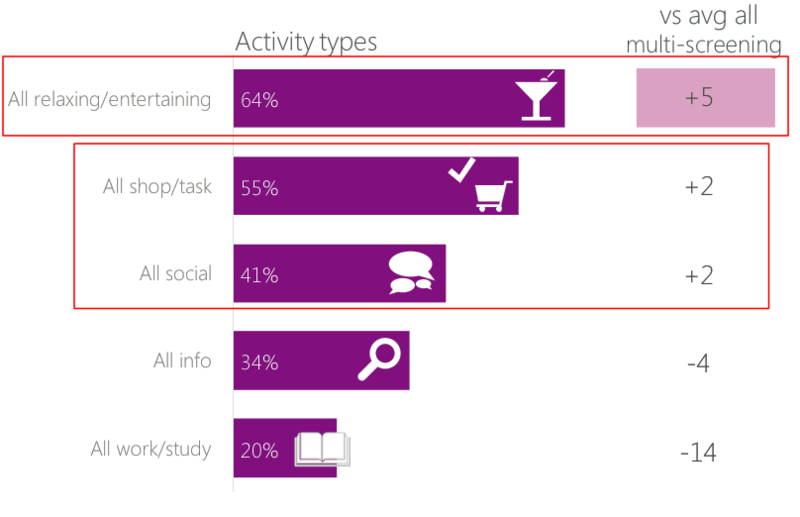 Participants use a variety of different content consumption approaches depending on the task at hand and their location. As a content marketer, it’s critical to consider these factors to help you create useful content that can be consumed for specific activities as well as across devices. Do these four content consumption habits make sense to you? 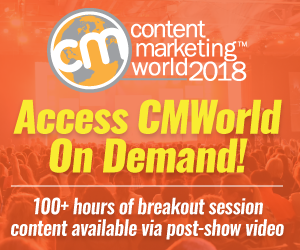 How would you take advantage of them for your content marketing? Earlier Ipsos research about device use and trends. Tags Flamingo research, Ipsos OTX, laptop, Microsoft, Mobile, Research, smartphone, Tablet, Televsion. Bookmark the permalink.